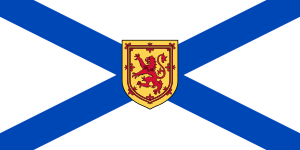 Nova Scotia (Latin for New Scotland) is a province located in southeastern Canada. It has a population of just under one million. Nova Scotia and its neighbouring provinces, New Brunswick and Prince Edward Island, are collectively known as the Maritime Provinces, which is often shortened to Maritimes. The region has a temperate maritime climate that may have become warmer in recent years due to global warming. Its capital is Halifax (which despite the province's name is named after a city in a different part of the UK, but at least the Citadel landmark (which nowadays is a tourist site) there has its male employees wear kilts, which should make up for that), which is located right across Halifax Harbour from Dartmouth, which eventually came to be considered part of Halifax. These people are why signs in New Hampshire say "Bienvenue au" touristas, or something like that (even though most people in Nova Scotia speak English). There was a total eclipse of the sun visible in Nova Scotia in 1972. This one guy was so vain he flew there in a Lear Jet just to see it. Carly Simon said so. ↑ And on Québec-printed maps, called Nouvelle-Écosse, because Latin is too un-French to tolerate. This page was last modified on 23 March 2019, at 01:46.